The information below is a useful reference for understanding your rabbit. However, if you are concerned about your rabbit’s health, it is not a substitute for diagnosis and treatment by a veterinarian experienced in the care of rabbits. One of the more common problems that rabbits develop is gastrointestinal stasis. It is a slowing down of the digestive process. It is a very serious condition that can cause rapid deterioration and death. Symptoms include a reduction or stopping of eating or a reduction in the amount and size of droppings. Stasis can be caused by many factors including: lack of sufficient exercise, stress, gas bubbles in the stomach, an abscess, changes in their diet (i.e. new pellets), eating the wrong foods, or disorders of the gastrointestinal tract. Some rabbits become prone to stasis as they get older. 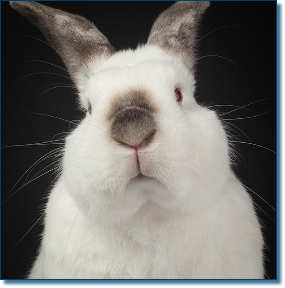 If your rabbit is showing any of the symptoms of stasis, you need to take action right away. The health of a rabbit that is not eating properly can deteriorate very quickly. Take your rabbit to a veterinarian who has experience treating rabbits. A rabbit with teeth problems can also stop eating. An examination of a rabbit that is not eating should include a thorough examination of its teeth and mouth. Diarrhea is another symptom of possible serious problems in a rabbit. A rabbit with diarrhea should see a qualified veterinarian right away. If your rabbit becomes overheated he can develop heat stroke. Symptoms include labored breathing, panting, flaring of the nostrils, distress or disorientation or, in some cases, convulsions. Heat stroke can lead to death and requires treatment. Mist his ears with cool water. Never put your rabbit into cold water or run him under cold water; the sudden change in temperature can kill him, and in any event, the process will only add to his stress. Take him to his veterinarian for treatment. If your rabbit stops (or significantly reduces) his eating, stops urinating or defecating, or becomes listless- you need to get him to a qualified veterinarian right away. Rabbits instinctively hide the first signs of illness, and won't show signs of health problems until they have progressed - so don't delay in seeking professional advice. Most veterinarians do not have significant experiences diagnosing and treating rabbits. Rabbits have unique biology, diseases and reactions to medications. Find a veterinarian who has treated many rabbits. And do so before problems arise - having a sick bunny is no time to be searching for a veterinarian.